I moved to the Clapton/Stoke Newington area from Hackney/London Fields last September and it didn't take me long to find a new favourite local. Whilst it's not as awesome as the best pub in the world (The Duke of Cumberland in Sussex), The Three Crowns is a great place for whiling away a few too many hours and pints at the weekend. Think mismatched tables and chairs, shabby sofas, the occasional dog and a brilliant residency in the Cornish Grill. Rustling daily deliveries of fresh seafood and meat into simple yet moreish British dishes, this pop-up (which started off as suppliers to places like The Ledbury, The Clove Club and Pitt Cue) keeps me coming back for more. S and I found ourselves ensconced in one of the many comfy leather sofas the other day and were aching for food so, naturally, we gave in and gorged. We shared pork crackling with thyme and apple sauce (big wedges of crispy crispy pig skin), potato crackling with smoked chilli mayo (more like potato skins but perfect for scooping the creamy condiment and grilled coleslaw (creamy with a bit of bite and smoke). 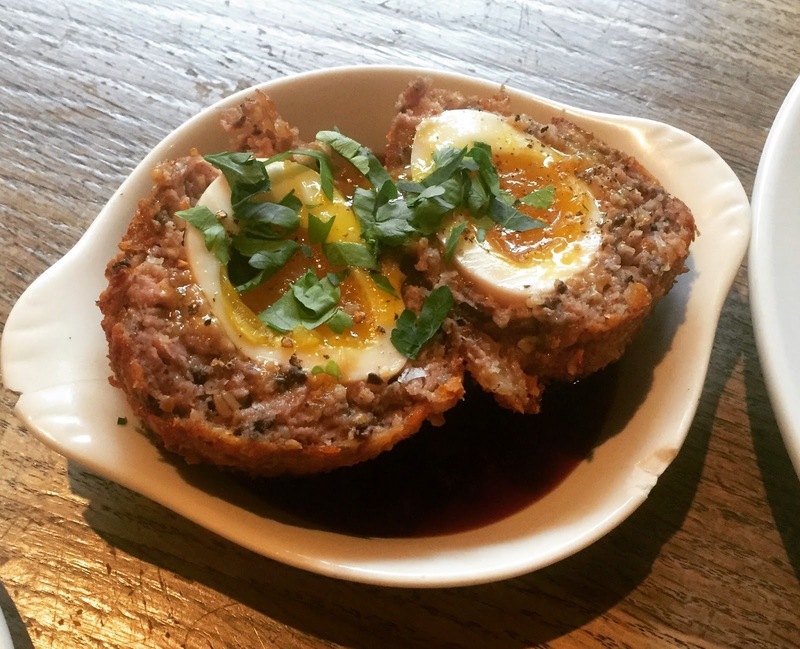 We then dove into the hog's pudding scotch egg with Cornish ale brown sauce; awarded the best in the UK, this had some serious living up to do - happily, it was dense and meaty (almost haggisy?) with the perfect yolk and a rich sauce to mop up every last bite. The house cured salmon with toasted rye bread and pickles was divine - thick rather than anaemic slabs of fish were lightly smoked with a flavour that was both smooth and deep. Finally we had goats cheese fritters - light bites of fried cheese matched with a honey dressing and candy striped beetroot - and I declared myself done. The Cornish Grill serves larger plates for those on a mission, daily specials and enormous Sunday roasts for when that Bloody Mary just won't do. With it being a 10 minute walk from my house, I'm practically a resident - I'll even fight you for that corner sofa, just you watch.